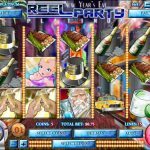 Reel Party Platinum is based on the original Reel Party game by Rival. For some reason they thought that there are still things to be said about a New Year’s Eve theme game and actually we agree. The original game was a bit too basic so this is an improvement in comparison. The Wild symbol is once again the Baby symbol and like in the previous game we have no idea why. There are two scatters in this game. Like the previous one the Profit-like Man is the first scatter and when landing 3, 4 or 5 of him you’ll win 10, 20 or 100 Free Spins. There’s also a 3x multiplier and a chance to re-trigger more spins. The second scatter is the Champagne symbol and landing 3 or more anywhere on the reels will trigger the Bonus Game. As in the original game you’re asked to select 3 champagne bottles out of many. Each will bring you a prize. If you liked the original Reel Party then this game is just the same only with slightly better graphics. Yet, it doesn’t mean that the graphics or the game is impressive. Like before we would only play it for the chance winning 100 free spins which is really cool. 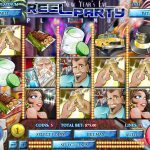 Check out the original version of this game here at Reel Party a 5 reel slot by Rival.